In summer we see worker bumblebees collecting honey; they are smaller than the female bumble bees that fly around in spring, but the characteristics of the species are the same. The radius of the collecting area of bumblebees is at most one and a half kilometres and in the nest up to a couple of hundred individuals may be active. They cannot be compared to other community-living insects as bees and wasps with populations of thousands of individuals. 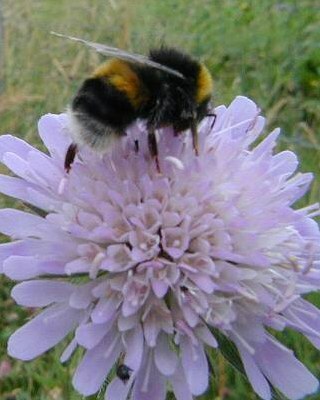 Only the young female bumblebees fertilized in autumn survive the winter (in favourable conditions). In early spring they start searching for a suitable place to make a nest because a nest is never used repeatedly. Our most common bumblebee. There are yellow stripes on the front part of the thorax and on the abdomen, and the rear tip of the abdomen is white. The main pollinator of lucerne fields. Bumblebees feed on plant nectar but feed their larvae with nectar as well as protein-rich pollen. Quite similar to the white-tailed bumblebee but on comparing the pictures you realise the difference. In which plants what bumblebee species get at the nectar depends on the length of its proboscis or sucking tongue – species with a long proboscis get nectar from flowers with deeply placed nectar holders. Of our bumblebees the garden bumblebee has the longest proboscis. 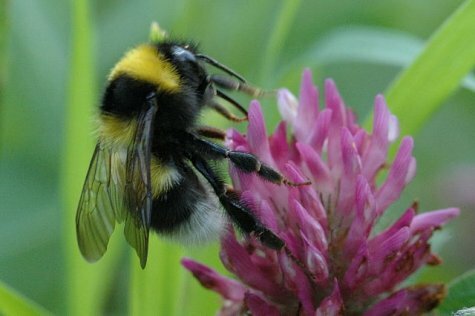 The sympathetic and unaggressive bumblebees are protection classed insects.